This startup story features Jeffrey P. Bezos, the innovative founder of Amazon. The company, which now generates over $61 Billion in Revenue and holds the title as the world’s largest online retailer, was started out of Bezos’s garage at 30 years old. The year was 94′ and Bezos was working diligently on Wall Street. At 30 years old, he began to see the internet revolution take place, and made the decision to quit his job and start an internet company. After making a list of the ‘top 20’ products that he could potentially sell on the internet, he decided on books because of their low cost and universal demand. It turns out, it was just the beginning…..
As a child, he spent summers at his grandfather’s ranch in southern Texas, “laying pipe, vaccinating cattle and fixing windmills”. The 18-year-old Bezos “said he wanted to build space hotels, amusement parks and colonies for 2 million or 3 million people who would be in orbit. ‘The whole idea is to preserve the earth’ he told the newspaper …. The goal was to be able to evacuate humans. The planet would become a park”. The initial startup capital came from his parent’s personal savings. Within two months, Amazon’s sales were up to $20,000/week. However, the company has continued to plow their revenue back into growth. 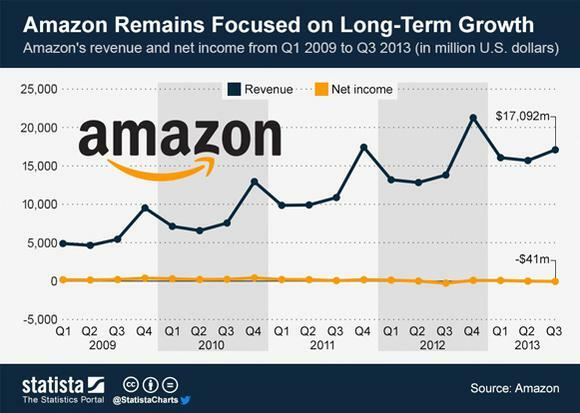 The chart below depicts Amazon’s continued focus on long-term growth, with profit remaining near $0 or below, and revenue rising. 1997: Amazon goes public at $18 per share. 1999: Bezos is named Time Magazine’s “Person of the Year” for popularizing online shopping. 2013: Bezos acquires the Washington Post.